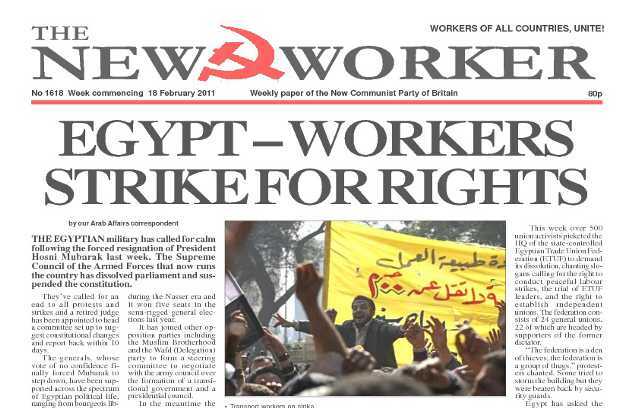 www.newworker.org | 18th February 2011 - Big society imploding. Cameron plays race card. Pressure grows on Mubarak. THE EGYPTIAN military has called for calm following the forced resignation of President Hosni Mubarak last week. The Supreme Council of the Armed Forces that now runs the country has dissolved parliament and suspended the constitution. LABOUR leader Ed Miliband is to speak at the rally at the end of the massive TUC march against the cuts on 26th March. He is not expected to take part in the march and is only one of a very long list of speakers. People are rejoicing throughout the Arab world at the news of the departure of Hosni Mubarak, the hated Egyptian dictator who was forced to resign by weeks of protests on the streets. Thirty years of tyranny, thirty years of treachery to the Arab nation and thirty years of crawling to the Americans and Israelis went last Friday when Mubarak bowed to the inevitable and threw in his cards.